The Place Taking over what was previously the space of Jin Shan Lou at the lobby of Marina Bay Sands (MBS) Singapore, Blossom is a contemporary Chinese and Cantonese restaurant which only opened about a month ago. The space of Blossom has the best of both worlds – privacy in the three private rooms or semi-private pavilions, or the more open concept dining area with gorgeous natural lighting in the day. I really like the wooden touches in the interior which adds that bit of zen to the dining vibe. The Food The restaurant is helmed by Chef Fok Kai Yee, previously from Summer Pavilion and Chef Jason Lau who was previously at Imperial Treasure Super Peking Duck Restaurant. The menu is quite extensive to say the least, with dishes ranging from classic Cantonese to Sichuan and Shanghainese cuisines. Dim sum items are also available daily till 4pm for some light bites. I tried a trio of dim sum during my visit; Steamed Siew Mai with Quail Egg (S$7.80/4 pieces); Blossom Signature Steamed Prawn Dumplings (S$7.80/4 pieces); and Golden Pear stuffed with Minced Pork (S$5.80/3 pieces). I enjoy the siew mai with quail egg topped on it and as I took it in one bite, there is an interesting contrast of flavours of the siew mai and the egg which works surprisingly well together. The steamed prawn dumpling is also a little different from the classic rendition as there is the component of squid ink within this skin. For soup, the Poached Bamboo Clam from Scotland with Cabbage and Fungus in Fish Broth (S$20/person) may look simple, though the flavours are very comforting. Resembling like a atas fish soup to me, the broth here is prepared for hours by extracting the essence and collagen from the fish, before being double boiled with Cloud Ear mushrooms and Tianjin cabbage. If you like your usual milky fish soup, you will enjoy this soup. 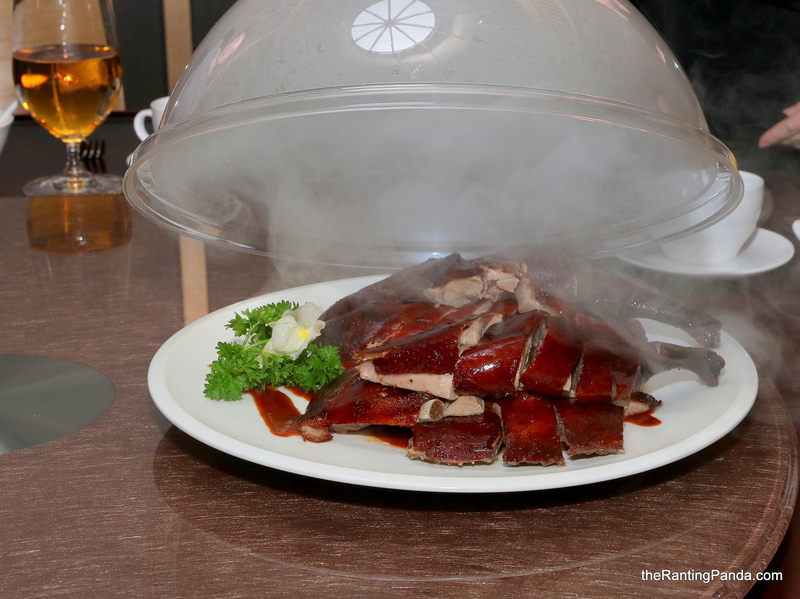 For meats, one of the signatures on the menu is the Royal Secret Recipe Smoked Duck (S$80/whole; S$40/half). With the smoky duck covered by a lid, that smokiness is still quite arresting for the senses. Smoked with 15 years naturally fermented aged Pu-Er and Chrysanthemum tea leaves, the skin of the duck is crispy and probably the part which retains most of the smokiness. The duck meat itself has less of the smoky flavour, though the flavour is still pretty competent. For a seafood dish, the Pan-fried Lobster Steak with Caviar (S$32/person) is another luxe treat. There’s not much surprise here for me, though there’s also not much to rant about the fresh Boston lobster flavour – always enjoyable. For dessert, I had the Chilled Avocado Purée topped with Tiramisu Ice Cream (S$10). I was quipping to my diners that this makes a perfect keto diet dessert. The avocado purée is rich and intense, though I’m not that big a fan of tiramisu. Rants For its prime location in Marina Bay Sands, the prices of the dishes in general at Blossom are fairly steep, with the exception of its dim sum items which are more reasonably priced. Will I Return Again? The space at Blossom is endearing, especially so during the day with natural lighting. Only qualm is that you do have to dine with noises coming from the hotel’s lobby. Food wise, the dim sum was impressive, and I am rather keen to head back to try more of what the dim sum menu has to offer.